I really need to sit down and go through my WIPS and piles for fabric earmarked for projects and actually write them down and plan what order I'm going to attack them in. But, we all know how long winded my posts can get and the linky for ALYoFs is closing in eight hours, so I've decided to concentrate, for now, on the one project that I really want to get finished and out of the house. Back in September I won Lucy's massive blogversary giveaway. 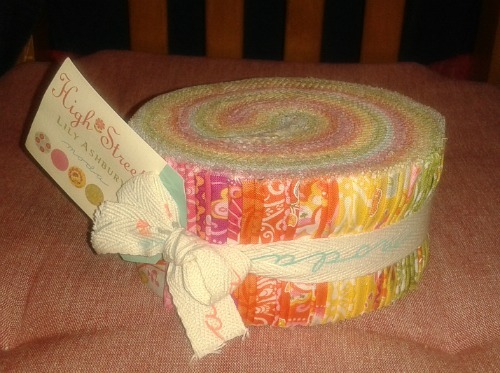 One of the many prizes was a jelly roll from the Fat Quarter Shop. I didn't know which jelly roll until it landed on my door mat. I'd not seen this collection before and I can't say that it was entirely to my taste. There are a few floral prints that don't really appeal to me. However, I love the colours and there are a few prints in there that are right up my alley! I didn't know what to do with this, I've never sewn a quilt from a jelly roll before, so it went to live with the rest of my stash for a while whilst I muled it over. In the end I decided to go for simple. One day in November the car was in for an MOT, which meant that I couldn't get to work. I could have worked from home but that wouldn't have been fun! Instead I settled for a day at home alone (oh so rare) with the sewing machine. Sometimes, even I can be neat! One of my favourite designs from the collection - I love it in all the different colours. And pressing. And sewing. And pressing. 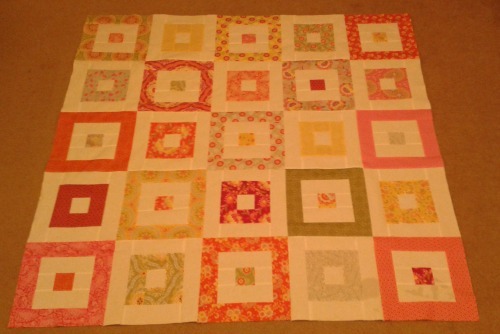 I'd decided that I wanted to get this quilt top finished before bed time. Only problem was I had to stop a few times. I had a doctors appointment (where she told me that I could start weaning myself of the meds! ), Had to pick the car up from the garage and then there was a much needed haircut. I was still doing quite well, and it looked like I was on course to go to bed at quite a respectful time. But I'd set myself a challenge. I wasn't going to bed until this quilt top was done and dusted. Does this pattern have a name? I've most probably seen it on someone's blog and it's made it's way into my subconscious memory but I didn't follow a particular pattern. I'd been posting my progress throughout the day (and night) on Instagram and the following morning, when they saw this picture, quite a few people stated that they couldn't believe that I stayed up until 3:00am sewing. Am I really that strange for staying up so late/early sewing? Or is it something that you do quite regularly too? Anyway, the following morning Endaf helped me get a daytime picture before work. You can see the colours a lot better here. 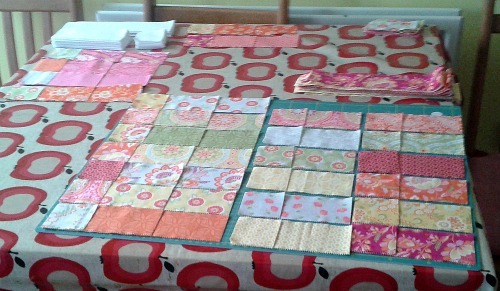 And then the quilt top was folded up and placed on my WIP pile. My LQS doesn't carry a great range of modern quilting fabrics, so I was surprised when they got yardage of this entire collection in. This meant that I could buy yardage for the backing without having to scour the internet and also saved on shipping costs! I couldn't decide which print to go for for the back but then my child minder became a grandmother for the first time and at 50.5" x 50.5" (unfinished) I thought that this would make an ideal present. I went to the LQS with baby girl in mind and came out with enough yardage of the small flower print in pink to make a pieced back. About a month later I was sorting through my scraps for a swap arranged by Kerry when I came across the left over strips for this Jelly Roll and decided that I would make a few extra blocks for the back but to change things up a bit I'd make the blocks 5" sq (finished) instead of 10" sq like the front. So I cut some teeny tiny pieces of fabric (that central square will be 1" finished) and ended up with this pretty little pile. 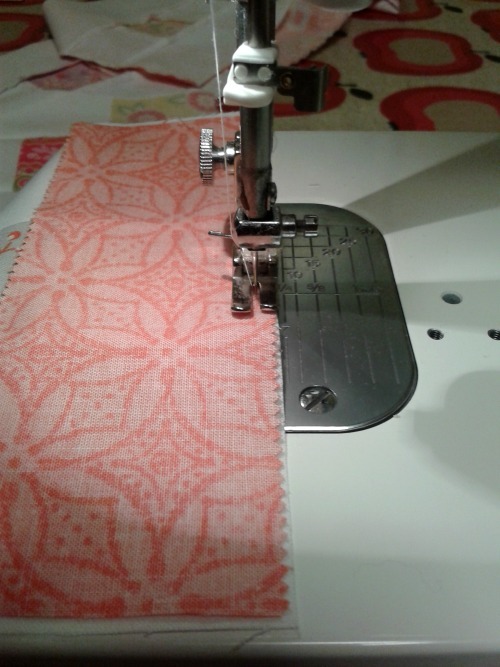 "I need to be more realistic about what I can achieve when it comes to sewing. I have a young family to care for and work five days a week. 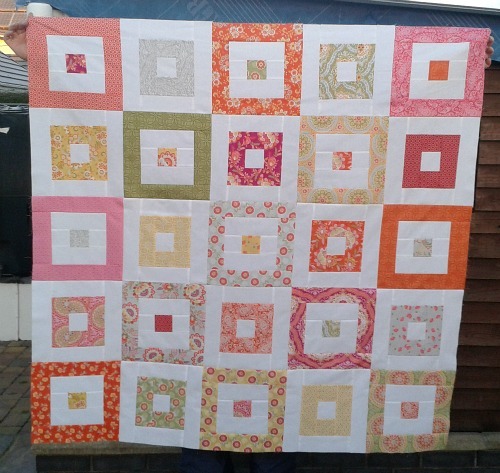 Added to this the lack of a designated sewing space I can't expect to be churning out five quilts a week"
With this in mind my goal for January is to have a completed quilt back ready to go (oh and a roll of binding!). 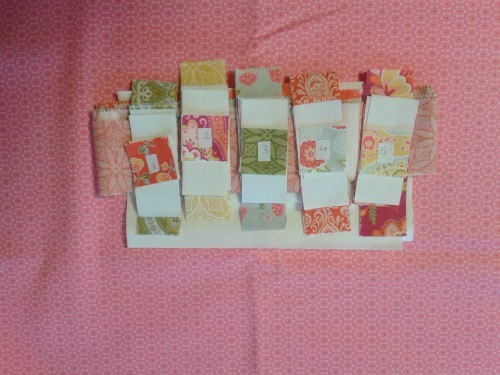 If I do manage to get some quilting done then that would be great, but I'll be happy enough if I can set my goal for February as "Quilt and bind Ella's quilt". Perfect gift, good luck with your goal! I have stayed up all night quite often when my children would come home with random "tomorrow I need to be ..." and I had forgotten/lost the letter/never had the letter. But not for about five years now! I think the last thing was an eight year old lion. My machine broke about 7.00 pm so most of it was hand stitched. That's the bit I remember most!! !